Last year, Japan’s central government completed a 35 billion yen (approximately $320 million) underground ice wall. Over 38 meters (100 feet) deep and nearly 1.6 kilometers (1 mile) long, the structure is meant to stop groundwater from mixing with the radioactive water leaking from the Fukushima Daiichi nuclear plant, which was severely damaged in 2011 by an earthquake and tsunami. While an idea seemingly plucked from a comic book, this wall of human-made permafrost was criticized for being too complex and potentially ineffective. Negative suspicions were confirmed when an investigation commissioned by the Japanese government found that while the wall is helping reduce the leakage of contaminated water, stronger measures are needed. 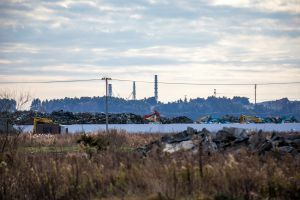 Seven years later, radioactive materials from Fukushima’s damaged reactor still contaminate groundwater and rainfall, undermining efforts to decommission the plant. The state of the reactor also made it extremely difficult to identify the position of the melted uranium trapped in the plant, which was captured on camera only last year. Even robots sent to investigate and clean up the site have not been able to withstand the radiation, exacerbating the crisis as the plant continues to contaminate groundwater and rainfall. According to the latest figures released by the plant’s operator Tokyo Electric Power Co. (TEPCO), the ice wall is reducing the amount of contaminated water inside the reactor’s buildings to 95 tons per day, while before the structure was built nearly 200 tons would collect inside the plant every day. Overall, the plant still contaminates about 500 tons of water daily, of which 300 are pumped out and stored away to be purified. “We recognize that the ice wall has had an effect, but more work is needed to mitigate rainfall ahead of the typhoon season,” said Yuzo Onishi, panel chairman and Kansai University civil engineering professor, speaking to Phys.org. The ice wall was expensive to build and costs about 1 billion yen ($9.5 million) a year to maintain and operate. But, while it is not a perfect solution, it has stabilized groundwater flows, and reduced the amount of water that needs to be pumped out to keep the situation stable. As clunky as a massive ice wall may seem, the Japanese government still doesn’t have a more elegant solution to a problem that long after the disaster remains as urgent as ever. And while the project may be far from ideal, it is imperative that Fukushima holds as little contaminated water as possible.